See scan - good condition. Some tears at left side of the sheet, but text and signature are intact and very fresh. 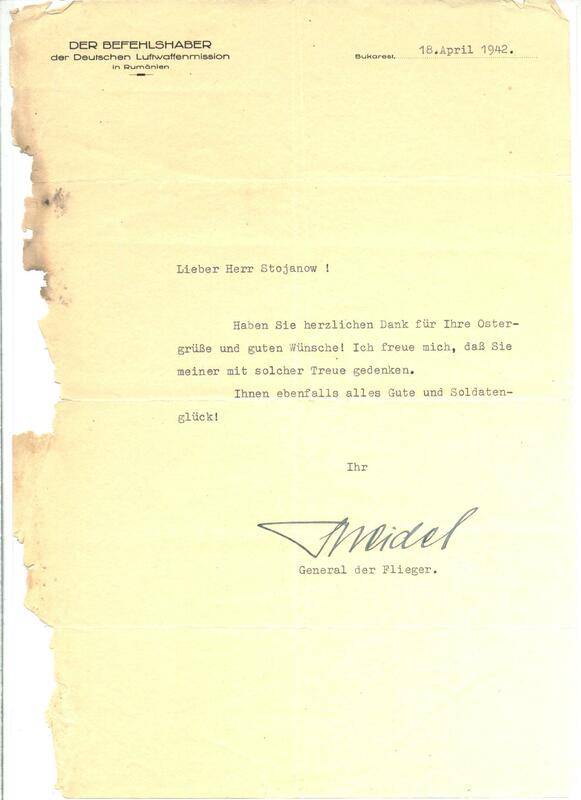 This is an extremely rare authentic NAZI German archive document letter sent by the NAZI German Pilot / Aviation Luftwaffe Commander and General Lieutenant Gen. Lt. Wilhelm Speidel at the time he was Commander of the German aviation units and troops in Romania and East Front. The document is printed at his official letterhead as DER BEFELHSHABER DER DEUTSCHEN LUFTWAFFENMISSION IN RUMANIEN and written on April 18, 1942. On September 17, 1940, Antonescu asks for a German Military Mission to train Romanian troops. On October 7, 1940 the first German troops enter Romania (the Military Mission would have 22,430 men of which 17,561 were from the German Army). On October 12, 1940, the leaders of the Military Mission arrived in Romania under the command of Erik Hansen, while the Aerian Mission / Deutsche Luftwaffenmission in Rumänien was commanded by General Withelm Speidel. By mid-November the 13th Motorized Infantry Division reinforced by the 4th Panzer Regiment, engineers, signal troops, six fighter and two reconnaissance squadrons, and some antiaircraft units had all arrived in Romania. 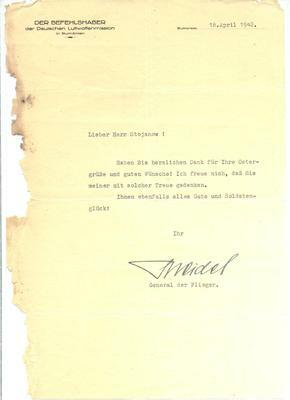 The document is richly signed in blue fountain pen by Gen. Wilhelm Speidel at bottom as General der Flieger. The letter itself was sent to his friend - the allied Bulgarian pilot ace Stoian Stoianov / Stoyan Stoyanov who had 18 kills and was a good friend with some of the best NAZI German aces. General Speidel Absolutely scarce militaria / military collector piece and one of the rare NAZI German autographs of Generals and famous ARMY personalities. The United Nations War Crimes Commission had found General Speidel as guilty in the trial of 1948 for Case No.7 for the Balkan Generals of crimes against humanity / Hostage Trial and was sentenced to 20 years of prison along with 11 other NAZI German Generals. We give LIFETIME Guarantee of Authenticity of the autograph / signature and this document as a whole.